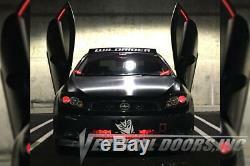 Bolt-On Lambo Kit for Scion TC 05-10. 2.4L 2398CC l4 GAS DOHC Naturally Aspirated. 2.4L 2362CC l4 GAS DOHC Naturally Aspirated. Doesn't fit your vehicle? To view our entire store. Allow your car door to open like a Lamborghini! 2 VDC hinges (one for each side). 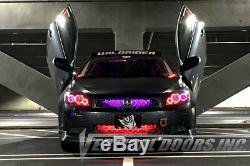 Kits (also known as Lambo Doors, Lambo Door Kits, Lambo Doors Conversion Kits, Lambo Door Hinges, Lambo Style Hinge Kits, LSD, VDC, VDI, VDC Kits, VLS, Upright Doors, Scissor Doors, Wing Doors, Butterfly Doors, Lamborghini Doors, Evo Doors, etc) your ride will keep its factory look and feel while you are driving but the moment you stop and raised your doors you will experience a whole new level of attention that no other upgrade can give you. Kits are proudly made and patented in the United States and are bolt-on kits made specifically for your particular vehicle. Only manufacture the best kits, best quality, best customer service, strongest kits, and most affordable for the quality. Not only are the kits easy to install but they are also easy to operate, basically open your door like normal until it stops, at a predetermine position and then just raised your door up until it stops. You also have the option of not raising the door since unlike most Lambo Doors, Scissor Doors, Wing Doors, Butterfly Doors, Lamborghini Doors, etc, imitators; Vertical Doors, Inc. Kits will allow you to get in and out without having to raise your doors. So as Big C stated it you can open your doors or you can OPEN YOUR DOORS. Does the VDC kit replace my doors? No it does not replace your doors. It only replaces your door hinges. When inside you will grab the door handle of the car. Pulling the door toward you the door will open 12 - 18 inches like they do normally. From there the door will stop and not open horizontally any further. Once done you will now grab the bottom of the door and lift vertically. The door will then reach a certain point which it will not lift anymore. At this point you will be able to get in and out of the vehicle. In normal case the bottom back portion of the door will be higher than the roof of the vehicle. When outside you will grab the door handle of the car. Once done you will now grab the edge of the door and lift vertically. The door will then reach a pre-determined point at which it will not lift anymore. What is the normal installation process? During a normal installation you will remove the front bumper and front fenders. Once they are removed you will remove the old hinges that hold the door to the car. With those hinges being removed you will install the VDC hinges and then reinstall the fenders and the doors. It is as simple as that. DR Automotive was founded in 1996 in Los Angeles, California. We started off as a warehouse distributor for several manufacturers of automotive and performance parts and soon made our way to retail and online sales. Our main focus is to give our customers the same experience as they would receive at their local shop. 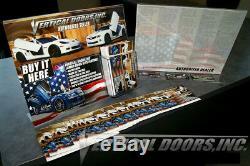 The item "Vertical Doors Inc. Bolt-On Lambo Kit for Scion TC 05-10" is in sale since Thursday, November 16, 2017. This item is in the category "eBay Motors\Parts & Accessories\Car & Truck Parts\Exterior\Other". The seller is "drautomotive" and is located in Irvine, California.